First create an XML file that only contains intervals, or download our pre-made interval XML file. Import the file and open the notation in your document according to the instructions on this page. Click on the notation so that the blue lasso appears, surrounding the notation. In the sidebar tools on the right, click on the "Assessment" tab. The "Convert" tab will be selected by default. 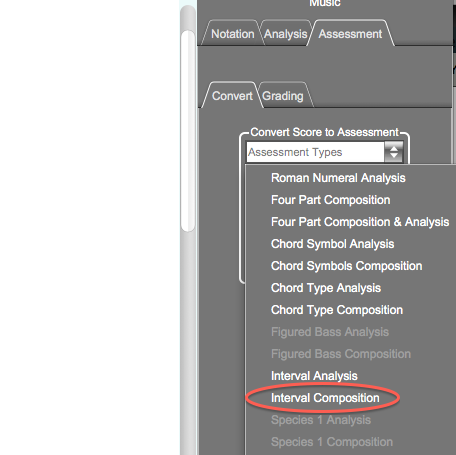 In the "Convert Score to Assessment" dropdown menu, choose "Interval Composition." 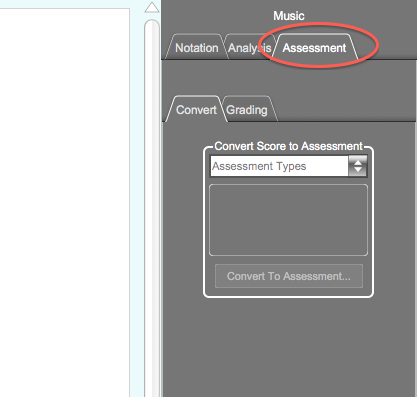 Then click the "Convert to Assessment" button. The sidebar will display different options now that the notation is an Assessment. 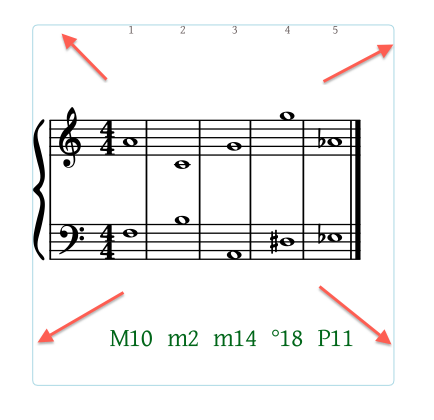 To make an assignment allowing students to compose intervals ABOVE the lower pitches, click on any of the pitches on the top staff of the notation and select "Convert Voice" in the sidebar. This converts the top "voice" into draggable rests. Draggable rests become pitches when a student moves them; they act like "answer spaces" for notations when a student completes an assignment. In the notation below see how the top pitches are displayed as rests. Save the document by navigating to the File menu and clicking the "Save" command. The automatic grading feature only works if you upload this assignment to your online class and download the assignment through the cloud menu. To do so follow the instructions on this page.